Staying healthy during pregnancy is something that all women want, and an important part of them is taking supplements or vitamins prescribed by our doctor, which are an important part of our babies are born healthy and avoid any congenital disease occur. According to a recent study by the University of Waterloo in Canada, taking supplements of omega-3 fatty acids pregnancy almost by a third reduces the chance of your child with asthma. The results of the research showed that women who were prescribed 2.4 grams of supplements of omega-3 long-chain during the third trimester of her pregnancy reduced the risk of asthma in their children up by 31%. Some of these long chain fatty acids are Eicosapentaenoic Acid (EPA) and Docosahexaenoic acid (DHA), are found in cold water fish, and help regulate the immune system response. Scientists analyzed blood samples from 695 women during the week 24 of pregnancy, as well as one week after delivery. Subsequently, tracked you each baby’s health during the next five years, that is the age in which the symptoms of asthma can be made clinically. For the study of measured levels of EPA and DHA fatty acids in the blood of pregnant women. Found that those with lower levels of EPA and DHA at the beginning of the study were those that benefited most from supplements since in these women the risk of their children suffered asthma was reduced by 54%. On these latest results, scientists consider that it is important to identify these women to provide them with supplements of omega-3 long-chain, as a measure for prevention and reduction of asthma in children. The brain and central nervous system need a regular supply of certain nutrients to function well. Sometimes the daily pressures we face at work and at home cause us to feel overwhelmed, stressed and sometimes even anxious. MindCare BALANCE has been formulated to provide natural but intensive nutritional support to help offer some relief from stress and anxiety. 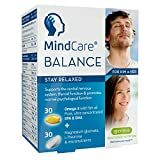 MindCare BALANCE provides targeted, fast-acting support for stress and anxiety with a bespoke micronutrients capsule containing magnesium glycinate, L-Theanine & zinc citrate, with B vitamin complex, vitamins C & D3 and selenium. Together, these bioavailable ingredients support the central nervous system, thyroid function & promote normal psychological function – essential to help regulate your stress levels and provide relief from nervous tension. 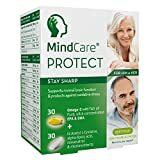 MindCare BALANCE is a comprehensive nutrition supplement providing the correct ratio of EPA and DHA omega-3 fatty acids to support the brain and promote healthy nervous system function. Omega-3 capsules provide the recommended daily intake of 250 mg DHA for maintaining normal brain function, with an additional 410 mg EPA in each capsule for extra support with neurotransmitter function (the chemical messengers that facilitate cell to cell communication in the brain). The omega-3 in MindCare supplements is ultra high purity, sourced from wild anchovies – these short-lived small fish are very low in the food chain and produce a very pure fish oil. Each box contains 60 (30 + 30) capsules, providing a 1-month supply at a daily dosage of 2 capsules.